ab53162 detects endogenous levels of total Retinoic X Receptor gamma protein. Synthetic peptide corresponding to Human RXRG. 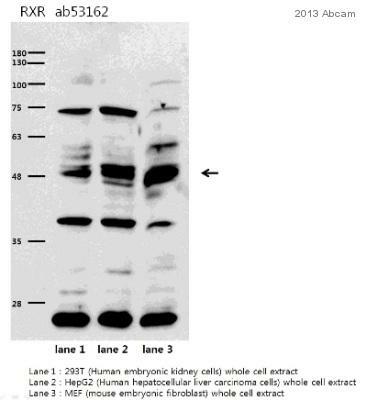 ab53162 was affinity-purified from rabbit antiserum by affinity-chromatography using epitope-specific immunogen. Our Abpromise guarantee covers the use of ab53162 in the following tested applications. WB 1/500 - 1/1000. Detects a band of approximately 51 kDa (predicted molecular weight: 51 kDa). Ab53162 staining RXRG in huma nucleus accumbens. Left panel: with primary antibody at a dilution of 4µg/ml. Right panel: isotype control. Sections were stained using an automated system (DAKO Autostainer Plus), at room temperature: sections were rehydrated and antigen retrieved with the Dako 3 in 1 AR buffers EDTA pH9.0 in a Dako PT link. Slides were peroxidase blocked in 3% H2O2 in methanol for 10 mins. They were then blocked with Dako Protein block for 10 minutes (containing casein 0.25% in PBS) then incubated with primary antibody for 20 min and detected with Dako envision flex amplification kit for 30 minutes. Colorimetric detection was completed with Diaminobenzidine for 5 minutes. Slides were counterstained with Haematoxylin and coverslipped under DePeX. Please note that for manual staining we recommend to optimize the primary antibody concentration and incubation time (overnight incubation), and amplification may be required. Publishing research using ab53162? Please let us know so that we can cite the reference in this datasheet.